Three shiitake mushrooms: Some fungi create their own breeze to disperse spores.Courtesy apc33According to a new study presented at the recent Annual Meeting of the American Physical Society's Division of Fluid Dynamicsin Pittsburgh, Pennsylvania, many species of mushrooms create their own breezes to help disperse their spores. Most times, mushrooms rely on wind to spread their offspring around the environment. But using indirect measurements, along with high-speed video and scaling analysis of fluid mechanics, researchers from Trinity College and UCLA have shown that before releasing their spores, some fungi create their own air movement through the release of water vapor that produces a convective dynamic to cool the air and get it moving. As slight as the breeze may seem, it's enough to move the spores to an adequate distance away from the mushroom parent. An unusual item among our many different food sources, the mushroom is a fungus, not a plant. 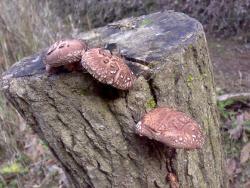 It grows from a spore, usually in the dirt or on decaying plant material, such as a log. Magic mushrooms have always been favored by some drug users. Now, one study finds that the same mushrooms might have utilizes in psychotherapy. The study discovered that religious participants that took psilocybin, the active drug in magic mushrooms, reported mystical encounters and better life satisfaction 14 months later. It is important to know that different types of ‘magic mushroom’ will differ in how strong and how toxic they are.